Today, the Yellowstone Commemorative Silver Dollar Coin remembers when President Benjamin Harrison defined the boundaries of the Yellowstone Forest Reserve on September 10, 1891. A New Proclamation from the President Defining Its Boundaries. From notes by Dr. T. S. Brandegee. This reserve lies east and south of Yellowstone Park. The portion south of the park, lying between its south boundary and the north boundary of the Teton Reserve, which is the parallel of 44° north latitude, and between the 110th meridian and the west boundary of Wyoming, was examined by Dr. T. S. Brandegee, and the following report has been prepared from notes furnished by him. This portion of the Yellowstone Park Reserve has a breadth from north to south of approximately 10 miles, and its length east and west is 51 miles. It comprises an area of 510 square miles, or 326,400 acres. The eastern part is drained northward by Upper Yellowstone River, while the greater portion of it is drained southward by Snake River and its tributaries. The elevation of the region is great, ranging from 7,000 to over 10,000 feet, with an average elevation probably between 8,000 and 9,000 feet. Upper Yellowstone River enters near the southeast corner and flows northwestward across the reserve in a marshy valley about a mile in width. East of the river the land rises to a high plateau 9,000 to 10,000 feet in altitude. West of it the country between the river and Atlantic Creek, which heads in Two Ocean Pass, is plateau-like in character, with summits exceeding 10,000 feet in altitude, and is much dissected by streams. The Continental Divide, separating the Upper Yellowstone from the drainage of Snake River, has a general altitude of about 10,000 feet, but is broken by several passes at much lower altitudes. The well-known Two Ocean Pass, in which head Atlantic and Pacific creeks, which have water communication, has an elevation of 8,200 feet. A pass separating Mink and Falcon creeks is slightly lower, its height being 8,100 feet. West of the divide and east of Snake River the country is mountainous, the summits ranging from 9,000 to 10,000 feet. There is little system to this country and the streams pursue circuitous courses. Snake River flows across the reserve, in a course a little west of south, in a marshy valley about a mile in width. The country west of Snake River is the northern extension of the Teton Range. It is here much depressed, presenting little of the rugged character which prevails farther south. On the southern border of the reserve these mountains reach an altitude of 9,000 feet, from which they descend to a depression at the north boundary of the reserve, where there is a broad pass, connecting the valley of Snake River with Falls River Basin, and having at the divide an altitude of 7,000 feet. Falls River Basin, which occupies the western portion of the reserve, is low, level, and very marshy, with an altitude slightly less than 7,000 feet. This region, owing to its great altitude, has an ample rainfall and a severe climate. It is probable that no part of it is suitable for agriculture. The question of agricultural lands in this reserve may, therefore, be dismissed on account of the climate. As a whole, this portion of the Yellowstone Park Reserve has much more forest on it than has the Teton Reserve, lying immediately south. This fact is largely due to the somewhat greater altitude of the region, and perhaps also to the fact that fires have not been quite so frequent or so destructive. There is no part of the reserve, except the limited areas which are above timber line, on which forests will not grow freely if protected from fires, and the fact that it is not entirely clothed with dense forests is probably due entirely, to the former prevalence of this destructive agent. The forests of this region are principally made up of Pinus murrayana, or lodgepole pine. Besides this species, groves of quaking aspen are scattered in many localities, especially where fires have raged in recent years. These are especially abundant west of the Teton Range. In certain localities Pinus flexilis is found abundantly, especially about Huckleberry Peak, on the summit of the Continental Divide, and generally on exposed ridges. There is very little Picea engehnanni (Engelmann spruce) in the reserve. It is found occasionally along the streams, and some is found about the slopes of the Continental Divide. Red fir is scattered about quite generally through the forests in isolated specimens. Abies lasiocarpa is nowhere abundant, but is generally found on the higher elevations and along the streams. In brief, the species are the same as found in the Teton Reserve, and their distribution is similar. Indeed, the general notes relating to the Teton Reserve will be found to apply very closely to this one. This reserve was mapped by the United States Geological Survey on a scale of 1:125,000, the relief being expressed by contours with intervals of 100 feet. Upon this map the distribution of timber is represented, its density being shown by shades of blue, the lightest shade representing wooded areas which are not regarded as containing merchantable timber, the next darker shade representing forests containing merchantable timber with an average of less than 2,000 feet B. M. to the acre, a third shade representing areas containing 2,000 to 5,000 feet per acre, while a fourth shade represents those containing more than 5,000 feet per acre. The red patches represent areas recently burned, upon which the forest has not yet made a start. It must not be understood that these red areas represent all those which show evidence of fires, since a large proportion of the area has been burned within a generation, and little of it has escaped fires at some time in the past. Since this reserve has not been subdivided, it will be necessary, in the detailed description of it, to refer to natural landmarks rather than to township lines. This description will be given by commencing at the east and going westward. The valley of the Upper Yellowstone is, in the main, open or covered with willow brush. The lower slopes of the plateau to the east are pretty well timbered, especially on the isolated summit known as Hawks Rest and on the slopes of the valley of Thorofare Creek. The higher slopes and the summit of the plateau are entirely bare. The northern end of the plateau separating Atlantic Creek from Yellowstone River is heavily timbered up to the summit. Following up the slopes of this plateau southward along the west wall of the valley of the Upper Yellowstone, the timber diminishes in amount and becomes reduced to scattered groves, which extend over the summit of the plateau, covering, perhaps, one-third its area. On the side toward Atlantic Creek this condition of things continues, but the proportion of land covered by the timber remains about the same. The valley of Atlantic Creek and the slopes of the plateaus rising from it on the west are covered with scattering groves of timber, one-fourth to one-half the land being covered. The plateau slopes rising from the valley of Falcon Creek on both sides are heavily timbered, but about the head of the creek the timber becomes scattering. The summit of the Continental Divide, from the north boundary of the reserve to Two Ocean Pass, is either bare or covered with scattered groves alternating with open parks. West of the divide, the country drained by the headwaters of main Snake River and Fox Creek is covered with scattered groves of trees. Farther south, between Pacific and Mink creeks, on the west slope of the divide, is found one of the heaviest bodies of timber in the reserve. It covers nearly 20 square miles, and is almost a solid forest, averaging over 2,000 feet B. M. to the acre. The central portion is the most dense, and there, for an area estimated at a square mile or more, the forests average more than 5,000 feet per acre. South of Pacific Creek is another considerable body of timber, averaging more than 2,000 feet per acre, although near the creek fire has destroyed some portions of it. The east slopes of Big Game Ridge contain very little timber, distributed in groves. The west slope of the ridge is quite similar in timber distribution, except near its southern end. Here is another heavy body, covering most of the country between Gravel Creek and the summit of the ridge, an area 4 miles in length by 1 mile or more in breadth. The country bordering on Harebell, Wolverine, and Coulter creeks contains scattered groves, the timber covering, perhaps, half the area. The timber becomes more dense farther down the course of main Coulter Creek. Southward, beyond the divide, along the streams flowing southward to Snake, there is very little timber. This region, extending on the north to the higher slopes of the hills, and eastward as far as Pinon Peak and the valley of Gravel Creek, has apparently been burned not long ago, and some portions of it, as indicated by the red patches, very recently. On this area there are no large trees, but here and there are scattered groves alternating with barren patches. This incipient forest is composed mainly of firs and Abies lasiocarpa. It contains, also, large areas of dead standing and fallen timber, the remains of the fires. The large area of timber represented as lying just east of Snake River, and extending eastward north and south of Huckleberry Mountain, consists mainly of dense groves of young lodgepole pines, interspersed here and there with dead standing timber, and on the higher elevations with Pinus flexilis. West of Snake River the triangular area north of the stream leading up toward Grassy Lakes is covered with a scattering growth of pines of good size, suitable for lumber purposes. On the south side of this creek, extending across the divide and down the west side of Teton Range, is a large area of good timber, grading above the 2,000-foot limit over most of the area, while in two localities, about Grassy Lakes and on the west side of the divide, it grades above 5,000 feet. Here and there throughout this body of timber are dead pines, standing and fallen, giving evidence of fires in the past. A similar, but smaller, body of timber is seen on the south side of Berry Creek. On the higher summit of Teton Range the timber is either scattering or entirely lacking. The only settlement within this part of the reserve is a station of United States troops on Snake River. There are no sawmills within it, and it is unlikely that there will be any demand for timber from it in the immediate future, as the nearest settlements of magnitude, those in Teton Hole and in Wind River Valley, may be more economically supplied from other sources. 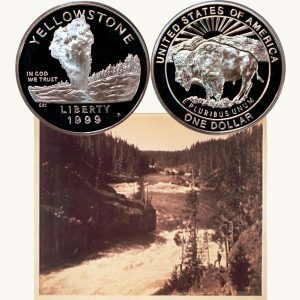 The Yellowstone Commemorative Silver Dollar Coin shows with an image of the Yellowstone River, circa 1892.